Nonpathogenic and hypovirulent strains of fungi that are closely related taxonomically to plant pathogenic species have been reported to provide biological control of a number of pathogens, including species of Fusarium, Rhizoctonia, and Pythium. Competition by nonpathogenic strains for host plant nutrients, colonization of roots and infection sites to preclude the pathogen, parasitism of pathogen hyphae, and induction of host plant resistance are mechanisms through which these nonpathogenic strains achieved biological control (Sneh 1998). Figure 1 Effect of G. catenulatum, formulated as Prestop, on reducing root rot and damping-off caused by P. aphanidermatum on cucumber seedlings. 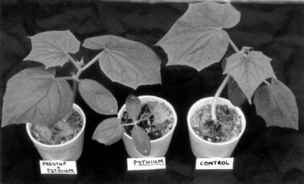 The plant on the left received the biocontrol agent at seeding time followed by the pathogen 10 days later; the plant in the center received the pathogen only 10 days after seeding; the plant on the right is the uninoculated control. Photograph was taken at 28 days after seeding. (Alabouvette et al. 1993; Fuchs et al. 1999; Larkin and Fravel 1998) through systemic induction of host resistance, and an increase in hydrolytic enzyme activity was reported in treated plants (Duijff et al. 1998; Fuchs et al. 1999). Induction of resistance by nonpathogenic fungi has also been reported to occur for binucleate Rhizoctonia species (Jabaji-Hare et al. 1999; Xue et al. 1998), P. oligandrum (Benhamou et al. 1997), and Penicillium oxalicum (DeCal et al. 1999). In plants treated with these biocontrol agents, induction of host defense responses, alterations of the plant cell wall, and enhanced expression of antifungal enzymes were reported (Benhamou et al. 1997; Jabaji-Hare et al. 1999; Xue et al. 1998). Further studies on the mechanisms by which these fungi elicit the host defense responses should provide interesting information on this group of biocontrol fungi. 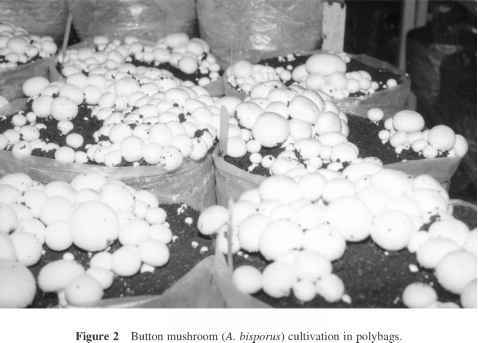 Formulations for biocontrol fungi such as binucleate Rhizoctonia species have been described (Honeycutt and Benson 2001). Techniques in biotechnology have been applied primarily to the nonpathogenic F. oxysporum strains that provide biocontrol of Fusarium wilt on a number of plant species. By creating strains expressing the marker gene ß-glucuronidase (GUS) through genetic transformation, the role of competition for root colonization between pathogenic and nonpathogenic strains could be elucidated (Eparvier and Alabouvette 1994). Nonpathogenic strains differed in their ability to colonize roots and to preclude the pathogenic strains, and the use of GUS-marked strains utilizing the glyceraldehyde-3-phosphate dehydrogenase promoter provided an estimation of fungal metabolic activity on the roots (Eparvier and Alabouvette 1994). A strain of nonpathogenic F. oxysporum transformed with the ß-glucuronidase (GusA) and hygromycin B resistance (Hph) genes could be detected at levels as low as 1 ng of mycelia and estimates of fungal biomass on tomato roots were shown to be considerably higher compared to a plating assay method (Bao et al. 2000), indicating this was a sensitive and rapid assay for this biocontrol agent in planta. The colonization by the transformed strain of plant roots could be assessed in relation to the extent of colonization of a pathogenic strain of F. oxysporum (Bao and Lazarovits 2001).